Star Trek Discovery episode 11 was a wild ride. There was finally some confirmation of big fan theories, a couple of near-death experiences, reveals upon reveals upon reveals and – you guessed it – Sarek’s goatee. Twitter has reacted accordingly, christening it one of the best TV shows going right now. Check the reactions below and, if you’re not watching it, what are you waiting for? Oh, and spoilers, obviously. Ash Tyler is Voq. We kinda already knew, didn’t we? 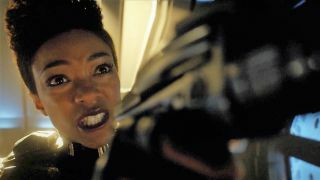 Either way, this episode confirmed it by not only having Tyler/Voq make an attempt on his Mirror Universe counterpart’s life, but also attempt to kill Burnham. His ‘execution’ was just the icing on an extremely twisty and turny cake. Lt. Stamets had a tough time of it this week. He opened the episode cradling the body of his dead lover, later died, came back to life (kinda) and ended up meeting Mirror Stamets. All in a day’s work on the Discovery. …Captain Georgiou! Some keen Twitter detectives saw it coming, the clever so-and-sos. Just ignore me while I hastily cross out ‘Mirror Michael is the Emperor’ from my conspiracy chalkboard. Nothing to see here. Is this the new Game of Thrones? Or even better? Honestly? It’s not far off. I can’t believe CBS have hidden this away on their subscription service yet they’re only too keen to shout from the rooftops about Young Sheldon. Anyhoo, the internet are more than happy to revel in the show’s brilliance.